Description: Cap: 1 to 5 cm, convex to flat, reddish brown to yellow brown, margin often paler, sticky when wet. Gills: close, white to slightly cream, just attached. Flesh: white, thin. Stem: 2 to 11 cm by 3 to 5mm, no ring, cream to yellow brown, brown to black velvet from base up. Odor and taste: mild. Spore print: White! Habitat: Late fall to mid-winter, single to clustered on hardwood stumps and logs, possibly on underground wood. Edibility: Choice. A bit more flavor than the cultivated variety. 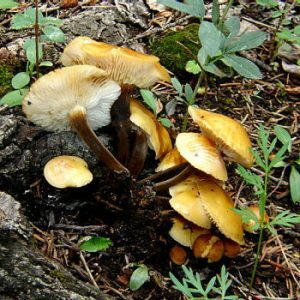 Notes: The cultivated version of this mushroom – Enoki – is grown in the dark with high CO2 to keep them white and force long stems. They have less flavor than their wild cousins and both have an interestingly firm texture. The close cousin F. populicula grows on poplars in the western US. The species contains a mild toxin when raw and should always be cooked. Combine soy sauce, mirin, sesame oil, garlic and ginger. Marinate chicken breast 2 to 4 hours in refrigerator. Soak shiitake in warm water 1/2 hour or until soft. Drain, squeeze dry, remove stems, and slice thin. Cook Udon in unsalted gently boiling water. Drain and rinse with cold water, then cover with warm water. Drain, pat dry and grill chicken breasts 5 minutes or until done. Let rest covered 5 minutes, then slice. Meanwhile, bring the stock to a boil in a large pot. Add Shiitake and simmer 5 minutes. Add bok choy and enoki, cook another few minutes. Drain and divide Udon into four bowls. Add two sections bok choy and 1/4 of the stock to each bowl. Top with divided chicken, radish slices and green onions.